One of the most effective ways of ensuring that you do your daily running. Is to have a training partner. 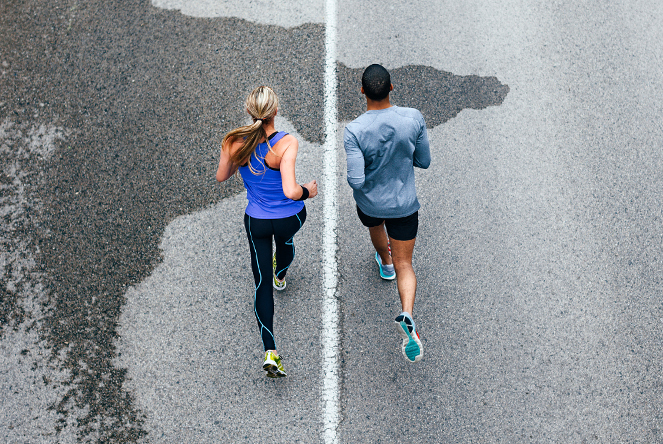 Many would like that running partner to be their significant other. There are some obvious pitfalls to avoid but on the whole training with your partner can be a very rewarding way of spending some quality time together. One partner is the ‘coach’. This can cause friction because the training relationship is uneven. You need to feel like both of you are contributing equally to the training. There are a couple of strategies to get around this. First off get a formal program agree to follow that or if you’d rather make it up yourselves then have one partner run the warm up and the other partner chooses the next workout and vice versa. This is by far the easiest way to train together when you have 2 people of differing abilities. You can do identical workouts by using a combination of Perceived Effort (PE) and time. Perceived Effort is on a scale of 1 – 10 where 1 is sitting on the coach, 5 is a very Easy run at conversation pace. 6 is marathon pace, 7 is 10 km pace, 8 is 5 km pace 9 is mile pace and 10 is 100 m sprint. A typical endurance run would be 40 minutes at PE 6. You can run side by side and chat as much as you like during the run. A speed workout of 1 minute at 8/10 and 4 minutes at 5/10 can provide a great interval session ie 5 minute warm up at 5/10, followed by 5 x (1 min 8/10 , 4 min at 5/10) , followed by a 5 minute cool down gives you a 40 minute minute workout. You could do a hill session of 5 minute warm up, increase the gradient from 1 % by 1 % every 4 minutes to a max of 8 % and then reduce it by 1 % every 2 minutes till its back at 0%, keep your effort at a steady 6/10 throughout. A typical week would be Tue – Speed , Wed – Endurance, Thur – Hills. Set Monday aside for recovery – stretching and gym work, Friday is a Wattbike session where once again you can train side by side following very similar protocols as suggested on the treadmill workout. Hill repeats are very simple to do side by side. Each partner works at their own pace. 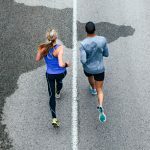 You can even do a different number of reps. A simple strategy for building power endurance in the weaker partner is to start each interval together running at identical pace. One partner then stops short and begins the recovery walk/jog while the other continues on up the hill. This is something you will see on any morning in the suburbs around the world where the running groups stops and waits at the top of the hill for the back markers to reach them before continuing with the run. Waiting until your partner catches up before you hare off again while they’re trying to catch a breath is not good for relationships. A better way to do the waiting is by running. So when you get to the top of the hill you turn around and run back past your partner a respectable distance before turning and following them up the hill. This strategy doesn’t have to be limited to hills. You can also do fartleks where you jog back easy along the route you have just run letting your partner continue running and then run hard to catch up. These are just a few ways to train with your partner. The key when training together is for both partners to be encouraging of the others training and to be a little creative when looking for positive ways to train together.